Avant Practice. By doctors, for doctors. As Australia's largest doctor-owned mutual, every day we see the increasing complexities our members face in running a successful practice. Just knowing what insurances are required can be a challenge in itself. We know, for example, that many practice owners assume their practitioner indemnity also covers their practice, which is often not the case. 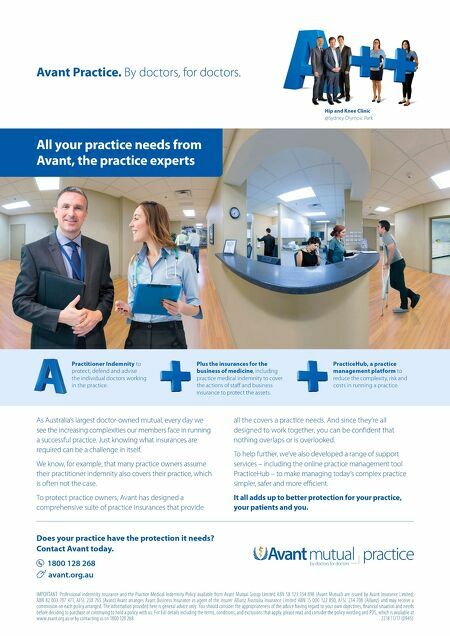 To protect practice owners, Avant has designed a comprehensive suite of practice insurances that provide all the covers a practice needs. And since they're all designed to work together, you can be confident that nothing overlaps or is overlooked. To help further, we've also developed a range of support services – including the online practice management tool PracticeHub – to make managing today's complex practice simpler, safer and more efficient. It all adds up to better protection for your practice, your patients and you. IMPORTANT: Professional indemnity insurance and the Practice Medical Indemnity Policy available from Avant Mutual Group Limited ABN 58 123 154 898 (Avant Mutual) are issued by Avant Insurance Limited, ABN 82 003 707 471, AFSL 238 765 (Avant).Avant arranges Avant Business Insurance as agent of the insurer Allianz Australia Insurance Limited ABN 15 000 122 850, AFSL 234 708 (Allianz) and may receive a commission on each policy arranged. The information provided here is general advice only. You should consider the appropriateness of the advice having regard to your own objectives, financial situation and needs before deciding to purchase or continuing to hold a policy with us. For full details including the terms, conditions, and exclusions that apply, please read and consider the policy wording and PDS, which is available at www.avant.org.au or by contacting us on 1800 128 268. 2218 11/17 (0945) Does your practice have the protection it needs? Contact Avant today. 1800 128 268 avant.org.au All your practice needs from Avant, the practice experts Hip and Knee Clinic @Sydney Olympic Park Practitioner Indemnity to protect, defend and advise the individual doctors working in the practice. Plus the insurances for the business of medicine, including practice medical indemnity to cover the actions of staff and business insurance to protect the assets. PracticeHub, a practice management platform to reduce the complexity, risk and costs in running a practice.